OnePlus, the Chinese tech startup that created the super hard-to-find OnePlus One, is already planning to launch a new phone next year. The company’s global director Carl Pei confirmed as much in a thread on Reddit in September, but now we’ve learned a few small details about the phone, rumoured to be called the OnePlus 2. It will probably be more customisable, since the company is aiming to produce more of its StyleSwap back covers around the time the phone launches, our source said. OnePlus released a Bamboo-style back cover for its One phone, but discontinued it in September due to manufacturing issues. OnePlus sold a few of those covers earlier this month, but since they were so limited you need an invitation to buy them. The company previously said it would release its StyleSwap backs in different materials such as wood, denim, and Kevlar, but we have yet to see any of these launch. There’s no guarantee manufacturing issues won’t arise this time around, but based on what our source says it sounds like the company is trying to produce more to coincide with the phone’s launch. The next OnePlus phone will likely still be cheaper than other off-contract Android phones. We’re hearing that the phone will likely cost less than $US500 even if there are significant hardware improvements since OnePlus wants to keep its margins thin. There will be some “surprises in store when it comes to hardware.” We have no idea what this means, but our source wouldn’t elaborate any further. OnePlus launched its One smartphone in April, and it turned out to be one of the most highly regarded phones of 2014 by both reviewers and consumers. There are two main reasons everyone’s been talking about the OnePlus One: it’s super cheap and extremely hard to find. 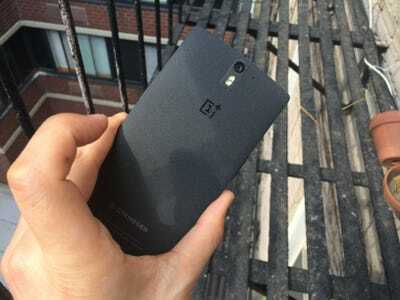 The OnePlus One costs $US350 off contract, which is a pretty unheard of price. Without a carrier subsidy, phones like the Galaxy S5 usually cost around $US600 off contract. With its OnePlus One, the company was able to include some of the best components, an attractive design, and a bright, sharp screen for about half the price of your standard Android flagship. Since demand has been so high, you can only order the One if you have an invite from someone who already owns the phone. OnePlus also rolls out preorders to the general public in limited time blocks, and the most recent one took place on Nov. 17.